Antibody is thought to react with whole molecule (1-37) and 23-37 fragment (C term). 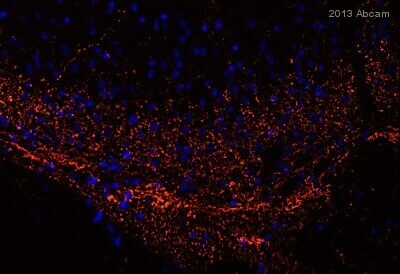 Specifically visualises CGRP in brain cells. Synthetic peptide corresponding to Rat CGRP aa 23-37 (C terminal). Conjugated to gamma globulin. Purified Ig by Ammonium Sulphate fractionation. Our Abpromise guarantee covers the use of ab36001 in the following tested applications. IHC-P 1/3000. Perform heat mediated antigen retrieval with citrate buffer pH 6 before commencing with IHC staining protocol. CGRP is present in C-cells of the thyroid and in central and peripheral nerves. CGRP has several important physiologic roles: it is a potent vasodilator, and can affect the force and rate of heart beat; it can modulate acetylcholine receptor function at the neuromuscular junction; it has been demonstrated to block tolerance to morphine; and it can modulate antigen presentation in Langerhans cells in the skin. Despite these important physiologic functions, therapeutic strategies using CGRP have been impeded due to the lack of a cloned CGRP receptor with which ligands could be developed. Immunohistochemistry (Formalin/PFA-fixed paraffin-embedded sections) - Anti-CGRP antibody (ab36001)Deiteren et al PLoS One. 2015 Apr 17;10(4):e0123810. doi: 10.1371/journal.pone.0123810. eCollection 2015. Fig 5. Expression of CGRP and P2X3 in rat dorsal root ganglia. Immunohistochemical detection of CGRP (left panel, ab36001) and P2X3 (middle panel) on cryosections of a dorsal root ganglion. The right panel shows the merged picture; the white arrows indicate neuronal co-expression of CGRP and P2X3. Animals were transcardially perfused with 4% paraformaldehyde in phosphate buffer (pH 7.4). The DRGs (Th13-L2 to L6-S1) were dissected out and post-fixed for 30 min. After PBS washing, DRGs were incubated in 0.01M PBS with 20% sucrose at 4°C overnight and embedded in OCT medium for cryopreservation. Cryosections (9 μm) were thaw-mounted on poly-L-lysine-coated microscope slides. As a blocking step, cryosections were incubated for 1 h with 0.01M PBS (pH 7.4) containing 0.05% thimerosal (PBS) supplemented with 10% normal horse serum (NHS) and 1% Triton X-100. Goat polyclonal anti-CGRP (calcitonin gene-related peptide; ab36001, 1/2500; Abcam) and rabbit polyclonal anti-P2X3 (1/500) were diluted in PBS supplemented with 10% NHS and applied overnight at room temperature. After rinsing in PBS, tissues were incubated with Cy3-labeled donkey anti-goat (1/4000) and FITC-labeled donkey anti-rabbit (1/300) diluted in 0.01M PBS (pH 7.4) and again rinsed in PBS. Immunohistochemistry (Frozen sections) - Anti-CGRP antibody (ab36001)Yu et al PLoS One. 2011 Apr 14;6(4):e18704. doi: 10.1371/journal.pone.0018704. Fig 5. Excised mouse bladders were fixed in 4% (w/v) paraformaldehyde dissolved in 100 mM sodium cacodylate (pH 7.4) buffer for 2 h at room temperature. In some cases, tissue was fixed by 100% methanol (4°C) for 5 min. 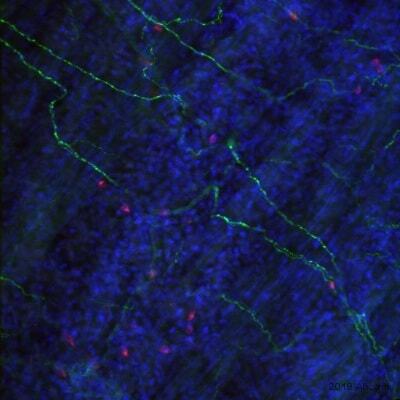 Fixed tissue was cut into small pieces with a razor blade, cryoprotected, frozen, sectioned (5 µm), and incubated with primary antibodies (1/100 –1/500 dilution) for 2 h at room temperature (CGRP labeled red, afferent nerves). After washing away unbound primary antibody, the sections were incubated with a mixture of Alexa® 488-conjugated secondary antibody (diluted 1/100), rhodamine-phalloidin (1/50), and Topro-3 (1/1,000). The sections were washed with PBS, postfixed with 4% (wt/vol) paraformaldehyde, and mounted under coverslips with p-diaminobenzidine-containing mounting medium. All immunofluorescent localization data shown are representative images of staining performed on at least three individual bladders. 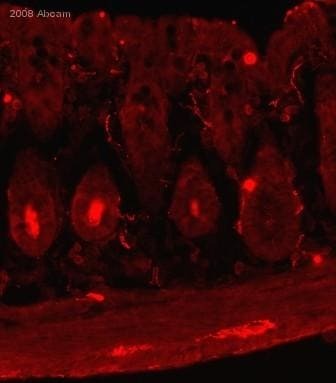 IHC-P image of CGRP staining on rat spinal cord sections using ab36001 (1/3000). The sections were deparaffinized and subjected to heat mediated antigen retrieval. The sections were then blocked using 1% BSA at 21°C for 10 min. Incubated with primary antibody at 21°C for 2 hours. 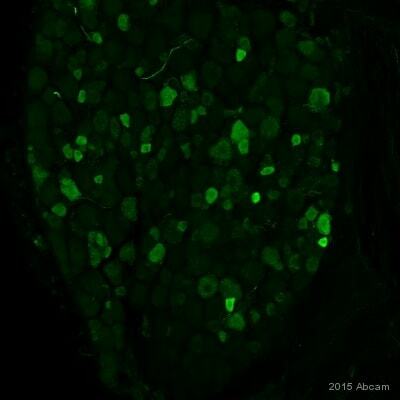 ab36001 staining mouse colon tissue sections by IHC-Fr. Sections were PFA fixed and blocked in 5% serum for 30 minutes at 24°C prior to incubating with ab36001, diluted 1/200 in PBS + 0.2% Triton X-100, for 18 hours at 4°C. The secondary antibody was an Alexa Fluor® 546 conjugated, diluted 1/200. Publishing research using ab36001? Please let us know so that we can cite the reference in this datasheet.